The first few years of our company could probably be described as a heady mix of optimism, wide eyed panic and frustration. I guess when you’re wrangling with that many extreme emotions, you almost don’t have time to think about whether you’re happy or not. Once the panic receded, the team grew and the cash started to roll in, everyone had a little more time to focus on themselves and whether they were actually happy – or not. We focussed a lot of time on creating new processes to try to tackle problems. I think I’ll have to take a lot of the blame for that. If someone wasn’t getting their job done, then we’d create a process to remove free thought from the role. If two people were getting on each other’s nerves, we’d create a process so they didn’t need to speak to each other. Unfortunately, we didn’t involve everyone who was affected by the process and this often made people feel worse. I think this created a psychological link between unhappiness and process, and the cause and effect got blurred along the way. Process is an essential part of business. It’s a way to remember conversations and agreements and to prevent solving the same problems over and over again. A company without process is like a person without a memory. It wouldn’t matter how clever or talented they were, without the ability to recall, without layering one experience over another, that person will never achieve their full potential. I don’t think it will surprise anyone to hear that when a conflict over process emerges in our company, it most often occurs between the sales teams and operations. Operations of course reliant on process to perform their roles, and sales, like the free market, innovating and flexing to maximise their return and opportunity. These conflicts have dented our goal of increased happiness and undone some of the progress we've made. As we dedicate time and energy attempting to create happiness in the work place, it is important to understand the structures and principles within the office that maintain happiness once it has been achieved. I believe that fully inclusive discussion and agreement on process is extremely important to maintaining happiness. The key though is to be inclusive and to make sure that employees and managers believe that a particular process is beneficial to them. It can't be dictated from above. The problem is that different people need persuading in different ways, and it’s the managers’ job to know what way works for their team. For as long as we fail to achieve this goal, our efforts to increase happiness will never fully succeed. I can’t claim to have solved this problem yet, but I know with certainty that it’s imperative to future happiness. I plan to carry on with the policy of engagement. I’ll offer opportunity to be involved in all decisions we make and all processes we define. A process created through involvement must be more able to withstand disagreement. If this works and if we can successfully communicate the fundamental value of process to all our teams then I think we may stand a chance of keeping all the happiness we’re fighting so hard to create. What we can't do though is return to the days where process was created to avoid discussion and separate people. We've been there, done that, and don't want to get the T-shirt. This is a good one Lar. It seems that a lot of responsibility for the success of processes is down to the manager(s) to make sure the process works for the work flow and the individuals' preferences and more often than not their 'convenience'. What if the manager(s) involved are not up to the task? Hi and thanks. 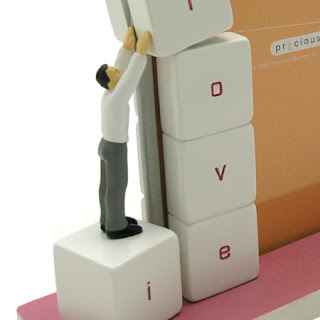 I especially like the picture of the guy making "i love" out of blocks. Genius. The issue you've raised is one I'm well aware of and so I'll write an article on my views about managers who just don't get it, next week. Hope you can wait that long.